Family wooden word cutout is perfect for creating a centerpiece for your photo frames, placing on the mantle or just about anywhere in your home! 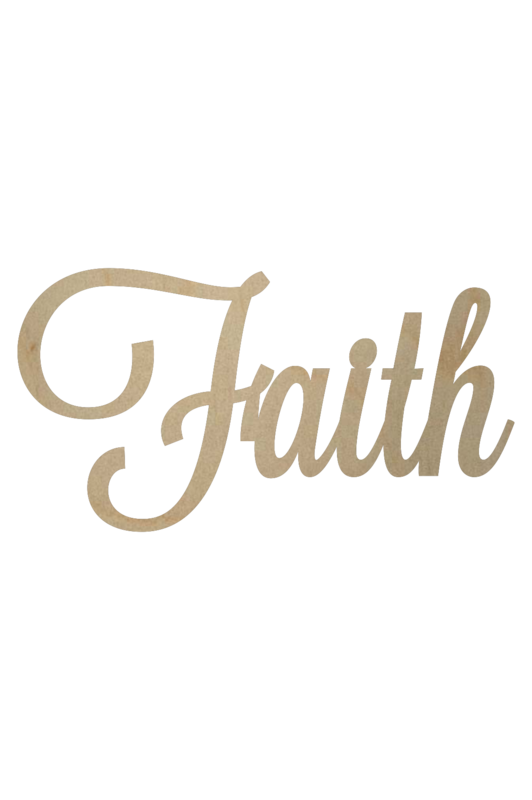 Size Choose an option1/8" x 6"1/8" x 12"1/2" x 12"1/2" x 18"1/2" x 24"1/2" x 30"1/2" x 36"
Looking for a Faith wooden word cutout sign? This word cutout is perfect for creating any number of projects that centers one of the most important things in life…faith. Create collage of picture frames featuring this in the center or top for something unique! You can make a pallet board backdrop and attach this to it for a unique and stylish piece of decor. You could also place this on the fireplace mantle or shelf for a simple addition that fits just about any decor. This is also perfect for just hanging on the wall in the faith room. Or just about any room for that matter. The faith wooden cutout makes a great addition for a new family just starting out or one that’s been established for many years. We cut these wooden faith word cutout in our Arkansas shop when you order them. This helps us to carry a wide variety of wooden cutouts and keep our prices low. Baltic birch plywood is easy to finish compared to regular plywood. It is virtually void free and is very stable and durable.